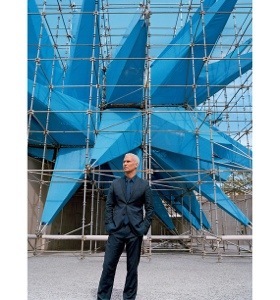 Just read a short article in the WSJ’s weekend magazine about Klaus Biesenbach who has the enviable position of MOMA’s Contemporary Art curator. He makes some good points about art needing to disrupt versus entertain, and the obvious in America that the market marginalizes art, and is perceived as a luxury and elitist. I agree, though I would argue the market spoils artists and the consumption of art also in the UK and Europe including Germany. I find the view of museum as a place of pilgrimage, like a cathedral you go to in order to reflect and get inspired interesting, and pretty popular in museum circles these days. I’m sure there is a statistic somewhere to back up the drop off in numbers in faith-based communities and the increase in museum attendance. However I still think curators are simply care takers of artworks – their job is to take care of the work and make sure the work is presented as true to the artist’s intentions as possible. That’s it. The idea of pushing artists’ boundaries and limits, and having specific vision and insight into the creative practice is off the mark. Museums now, especially contemporary ones, must try harder and harder to keep their attendees entertained in order to sustain themselves. There are so many features now about engagement with museum attendees it’s almost as overwhelming as the abundance of images (e.g. Suggesting new labels for artworks at the Tate, or lining up so that you can be part of Marina Abramovic’s work by staring at her, or anything done by Olafur Eliasson). So if the art mustn’t be entertaining to be strong work, why must the museums be so entertaining? It can be exhausting these days to have to engage all the time in a museum setting. After college I worked briefly at the Museum of Fine Arts in Boston as the assistant to the public relations director. It was in this position, and subsequent work and involvement with museums that the incredibly strong ties to market and consumption become obvious. Things are done to please donors and line items on balance sheets and the general public. This article paints a picture of Mr. Biesenbach working as a true artist without the influence of market gestures and demands. This, of course is not a rational statement, and of course he needs to please donors, dealers etc. If curators really want to be artists they need to look OUTSIDE the art world for influence and inspiration…unless of course it’s making art about art – a totally valid direction. However, if they want to be priests of these new cathedrals of influence, they need to make some rules and always fall back on them in all of their endeavors in order to keep their audience (see methods of catholic church, etc). Which is really what I think they do (art history and the business of art rules), they are just in a sorcerer stage I think where they are imagining themselves as art predictors and sages. When in reality we all know its impossible to predict the future, only have a good hunch. Artists are creating the work and breaking all the rules, not so much curators. One follows the other. Lastly, he mentions that there is still not a global consensus to what art is or what it can do. I disagree – arts are a global way to communicate something that has no corresponding words, however relevant the intent and feeling. It comes in many forms (e.g. image, song, action). That’s it. I think what he meant to say was there is no global consensus on the future of art in museums or what museums can do for the arts.